Bread season is here once again. I guess, to be honest, it is bread season all year round at our house. Bread is one of those things I love to make. But when the air turns crisp, I can’t think of anything better than the smell of bread baking in the oven. Don’t you agree? 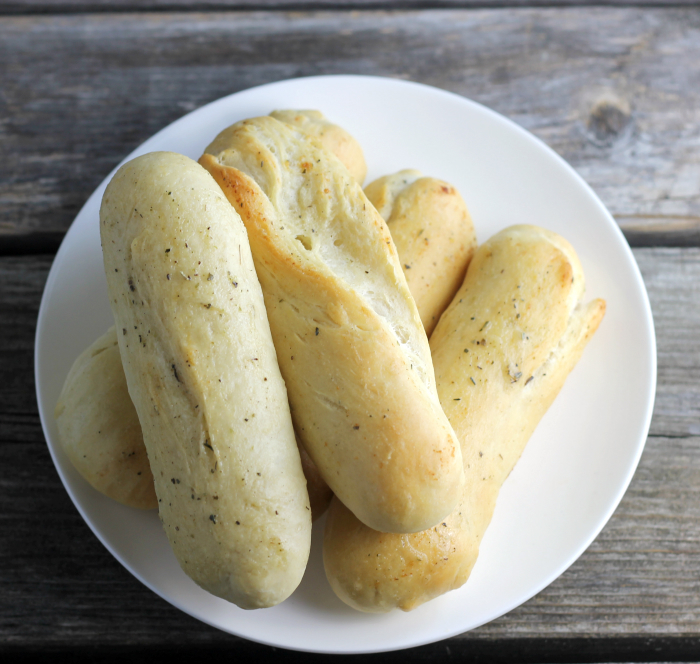 These garlic butter breadsticks fit the bill. I made these garlic butter breadsticks to go with the salad from my last post. It was a couple of hours before dinner and I was thinking about what to serve with the salad and crusty bread popped into my head. I mentioned to Mike that it was too bad that we didn’t buy a loaf of French bread when we were grocery shopping. That is when he said that fresh bread would go even better with the salad. That is when I pulled out my bowl for making bread and started making the bread dough. Don’t you just think that some meals are just better if you have fresh bread to go with them? 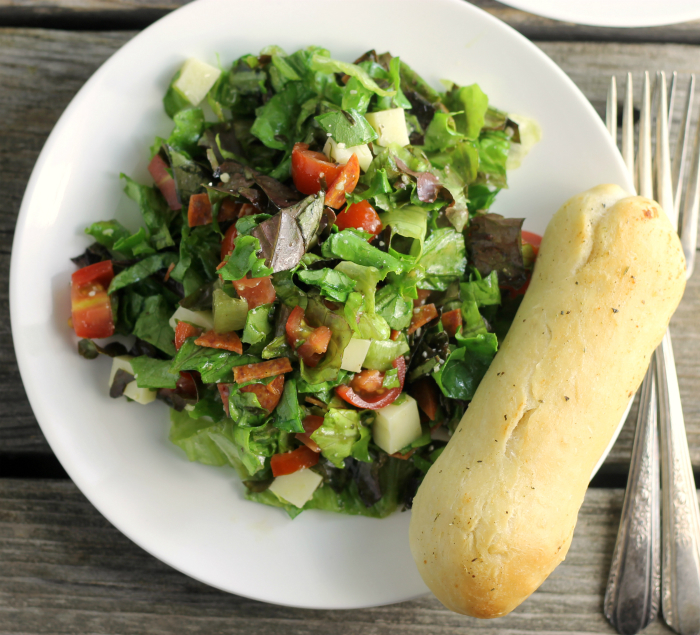 I know that the garlic butter breadsticks made a delicious salad a notch better. This stems from when I was a kid. There was always homemade bread on the table. Even for breakfast, there was toast made from homemade bread. I don’t go that far, to serve homemade bread with each meat but I do love to serve fresh bread when I can. 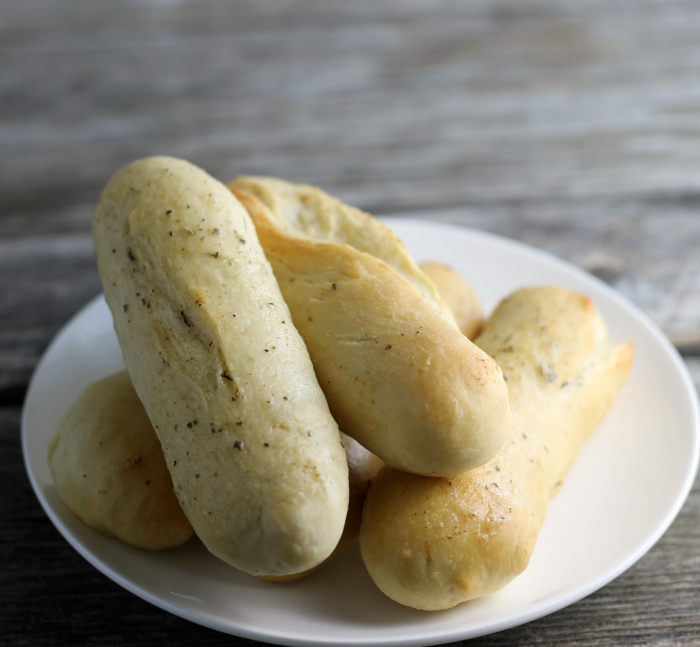 As for these garlic butter breadsticks they are soft in the center and have a nice crusty top. You get a taste of the garlic butter in each bite. The garlic butter is brushed on before baking and once again when they come out of the oven. Also, I want to mention that they freeze well. I actually took one out of the freezer and popped in an oven that was heated to 350 degrees F until it was heated through and it was just as delicious the second time around. Want to make your meal a notch better? 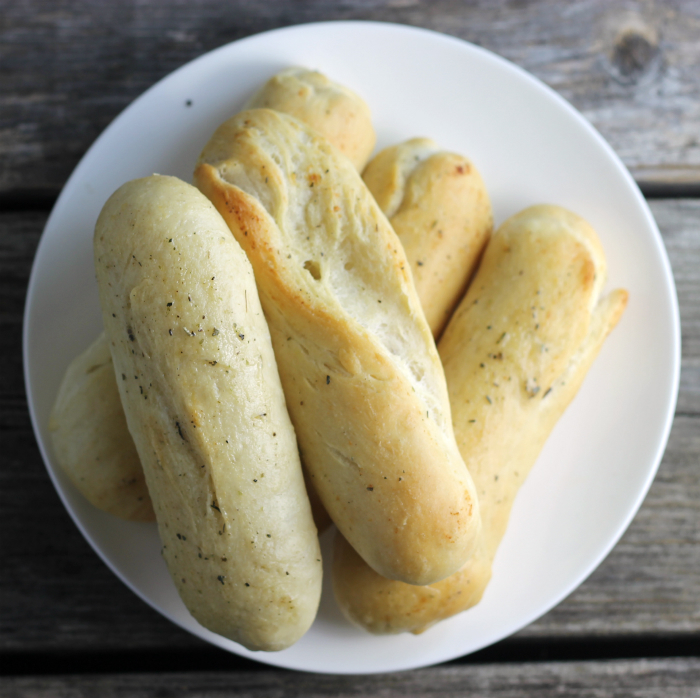 Add these garlic butter breadsticks. In a large bowl combine the yeast, one cup of flour, sugar, and salt. Heat water to 120 to 130 degrees F. Add the water and olive oil to the flour mixture and mix in. Gradually add the rest of the flour mixing it in by hand, Knead until dough is smooth and just sticky to the touch. Roll the dough between your hands to create a 5 to 7-inch rope/breadstick. Let rise for 1/2 hour. While the breadsticks are rising melt the butter. Stir in the garlic powder and Italian seasoning. Once the breadsticks have risen, brush the breadsticks with butter (using half of the butter) and place in the preheated oven. Bake for 13 to 17 minutes or until lightly golden brown. Remove from the oven and brush with the rest of the melted garlic butter. I love the look of these and they will be made shortly. However, I may commit sacrilege. I think one of these would be great around one of my bratwurst. Don’t hate me. Your breadsticks look so delicious! I do agree with you about year-round baking. In winter, it’s so nice to heat the house up (plus, there’s not much to do outside), and in summer, the house is the perfect temperature for rising dough! I love garlic breadsticks and this looks so perfect and delicious!